One of our major beliefs is that the person you meet is the same person that will complete the task. Design is a very personal business and there needs to be chemistry between client and agency. Understanding a business, how it works, its features and benefits along with what it actually delivers all start to build a picture of what is required before any creative work is undertaken. Once the parameters of the brief and the background is understood the creation of the Brand Name, the Visual Identity and any supporting strap lines will take place. Once the creative process is underway we keep our clients informed of all stages of progress/timelines and make sure that at final delivery their expectations are exceeded. This is the way we approach all of our projects, building long term relationships and trust. Juice Factory would create a detailed response to the brief including our understanding of the project, our proposed stages of work and timescales. A range of design concepts would be created and presented. We would look at a broad spectrum of different approaches and these would cover the use of alternative brand names, colour, typography, multi-lingual aspects and the use of graphic elements to create the Visual Identity. It is anticipated that this stage would include in the region of 8-10 concepts. These designs would be presented as boards showing the Visual Identity in isolation along with 2 or 3 other applications showing how the concepts would work on other promotion tools creating a Brand Theme. 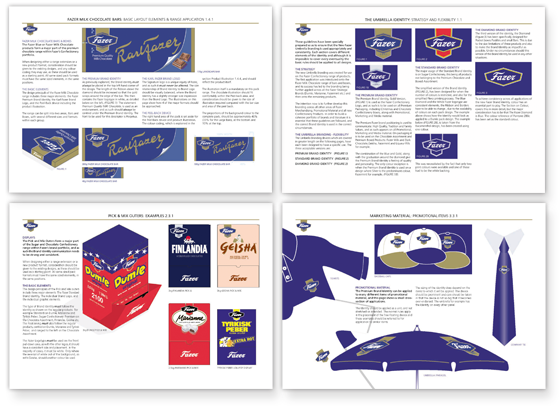 After the Design Concepts / Brand Themes have been considered, the Design Development stage would take place. This would include combining concepts, developing brand names and taking on board general comments from the client. We would envisage that around 3-5 routes would be developed. The 3-5 designs would then go through a small research panel where their brand appeal, strap line/adaptability and overall suitability would be assessed. Following on from the research a final design would be developed and presented for approval. The Visual Identity would then be converted into print and screen ready artwork. Different file formats, for use in a range of applications would be created. Once the Visual Identity and Brand Theme have been agreed and the artwork created, design for the Brand Guidelines would take place. This would include details of how the new device works; its application onto different promotion tools; specification of colours, typography and how it may be adapted to suit the needs of other consortia. The brand guidelines would also set out the permitted use of each of the individual file types as versions that can be used in all applications. For example a low resolution web based file must not be used for high resolution printing. It is envisaged that the Brand Guidelines would take the form of an online PDF document which can either be distributed via email or downloaded from the Company website.